For this second label spotlight I decided to feature two labels that, whilst being very much their own entities, are also inexplicably linked and share one another's passion for the music they release. The USA's Bindrune Recordings and Sweden's Nordvis Produktion have been collaboration for a number of years now, releasing bands whose music combines black metal, ambient and folk music and an inspiration/respect for the nature around them. Bindrune began in the year 2000 while Nordvis has been active since 2007. This feature focuses on three releases that were the result of this partnership. The first release I've picked out for this feature was released in 2014 by a UK black metal duo called Ahamkara. "The Embers Of The Stars" was the only release by the band, who sadly lost vocalist Steve Black in 2015. This review serves as a reminder of the breadth of passion and talent that exists amongst UK bands, no matter how short their tenure may have been. This record was released digitally by the band and on cd by both Bindrune and Nordvis. “The Embers Of The Stars” stretches to over 45 minutes and as the sprawling and icy sound of Midwinter’s Hymn fills the airwaves, it’s easy to understand why Ahamkara chose to let their songs breath. The cold shrieks of Steve Black (R.I.P) coupled with the unstoppable percussion is only tempered by the atmosphere generated by the guitar and melody of the synths. The ominous gusts that litter the song sound like ghosts on top of lowly moors. 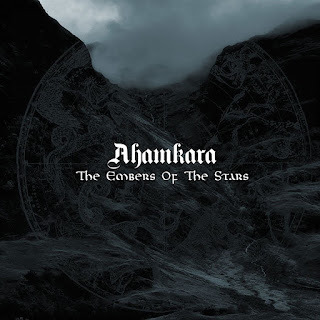 Ahamkara don’t take the raw/necro approach to black metal, as you may have already discovered. The production and mastering on the album is very strong indeed. On The Shores Of Defeat demonstrates an affinity with US bands like Wolves In The Throne Room, as well as lesser known bands like Czech/German band Arthedain. Lengthy instrumental passages provide ambience in between the verses, providing the listener with the opportunity to rest between the darkness that envelopes the song. The second half of the album turns in a slightly more old-school direction with Lamentation Of The Wraith, but loses none of it’s melody. It leads you on a journey into your own horrifying psyche and is quite unnerving thanks to it’s pace and the keyboard effects that Ahamkara chooses to employ. Fourth and final song To Invoke The Stars Themselves is the most hauntingly ambient piece on the album. It begins with the sound of the wind and lapping waves as the instrumental intro builds in volume. More off-kilter in places but equally as ravaging, Ahamkara takes no prisoners. It may be strange of me to say that there is something comforting about their music, but it’s true. The fact that they mix heavy and dark black metal with melody and moments of quiet beauty makes this a special release, especially given the short existence of the band. It serves as a eulogy to both the band and indeed to Steve Black, one that mustn’t be forgotten. Fast-forwarding two-and-a-half years (since the Ahamkara release) and this split between German band Waldgeflüster and Bindrune/Nordvis mainstay Panopticon was released in September 2016. Waldgeflüster hail from Bavaria and have been together since 2005, releasing four full-lengths including "Ruinen", which was released by Nordvis a month after this. The one-man US black metal/folk band Panopticon has been ever productive since it's inception in 2007, releasing no less than six full-lengths and eight splits (including this one). This record was released digitally, on cd and on vinyl and proves why all parties like to "keep it in the family" so to speak. Waldgeflüster opens up with Der Traumschänder, which is made up of amazing post-metal style riffs and native-language roars/semi-clean vox. There is a lot more to their sound than just black metal, as the lead-guitar driven atmosphere permeates through the song. There are sections within it where they build up before slowing down and the folk sections featuring violin (or viola, I’m not sure which) were something I wasn’t expecting. 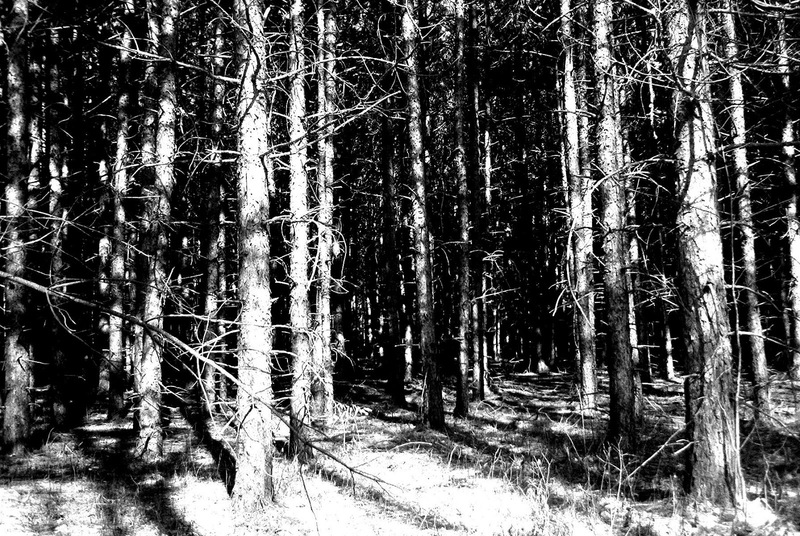 It’s not often that here those elements in black metal these days but they are very welcome and add an extra layer of mystery and beauty to this 12+ minute song. Waldgeflüster’s second song Norwegian Nights is a gentle ballad with piano, acoustic guitar and clean singing (this time in English). It’s shows a different and more fragile side to the band. Panopticon initially is very much US black metal. Austin Lunn’s singular vision really comes to the fore during Håkan’s Song. It’s opening passage is filled with a percussive battery that seems to follow on through the rest of the song. The guitars rest within the mix and compete with the harsh vocals, suiting the more traditional approach. There is still room for an introspective section featuring emotive guitar and the sound of children talking/laughing which brings some lightheartedness to the song and lifts the mood. Trauerweide II (like Waldgeflüster’s Norwegian Nights) is an opposite to the song that came before it. The skillful guitar playing is accompanied by clean singing, which shines on Panopticon’s US roots. This split is another gem that I missed out on last year. The musicianship is great and I really like the way both sides are delivered with the extreme song followed by the mellower one. Amazing. My final review of this spotlight focuses on the new full-length from longstanding US black-metal/folk band Falls Of Rauros. It saw the light of day at the end of March and is the first collaboration of 2017 by both Bindrune and Nordvis. "Vigilance Perennial" is the band fourth full-length since their birth in 2005, all of which have seen both labels involved along the way. I think this is the perfect way to end this particular piece. This album is available digitally, on cd and 12" via both band and labels. One thing I’ve noticed while doing this piece is how each band has had a different style and originality. It’s the sign of a good label (or labels in this case) when they can spot bands that possess this and it’s also a sign that the bands themselves aren’t content with copying each other or watering down their music. Falls Of Rauros is a case in point on “Vigilance Perennial”, where opener White Granite combines the usual harsh vocals with melodic, often duelling guitars. There’s progressive tendencies in their music too, but the not the sort that become to cliched or head-scratchingly complex. Falls Of Rauros use progression to craft a sound that’s majestic. They’re no strangers to ambience and atmosphere either, as the gentle build up on Labyrinth Unfolding Echoes demonstrates. It’s that build up that breeds anticipation for what’s to follow, as it’s heavier but not so intense that it turns into an endurance test. I guess that’s another thing worth mentioning about Falls Of Rauros and the other band’s I’ve reviewed here. Yes their songs can be long, but they all do their best to write and perform them in such a way that they are constantly enjoyable and interesting. That’s a skill that some bands seem to lack. Warm Quiet Centuries Of Rain is a short instrumental that gathers their more sedate instrumentation and distills it into two-and-a-bit-minutes of calming and reflective guitar-led music that breaks up the record. What it doesn’t do though is prepare you for probably the most straightforward black metal song on “Vigilance Perennial”, Arrow And Kiln. Okay, so it’s not straightforward in a traditional sense but it is faster and more folk-inspired. They still make time for more introspection midway through the song as well. The final song Impermanence Streakt Through Marble is very much tempered with restraint. It’s the final opportunity that Falls Of Rauros gets to show where they are musically at the moment and it’s once again a journey in itself. 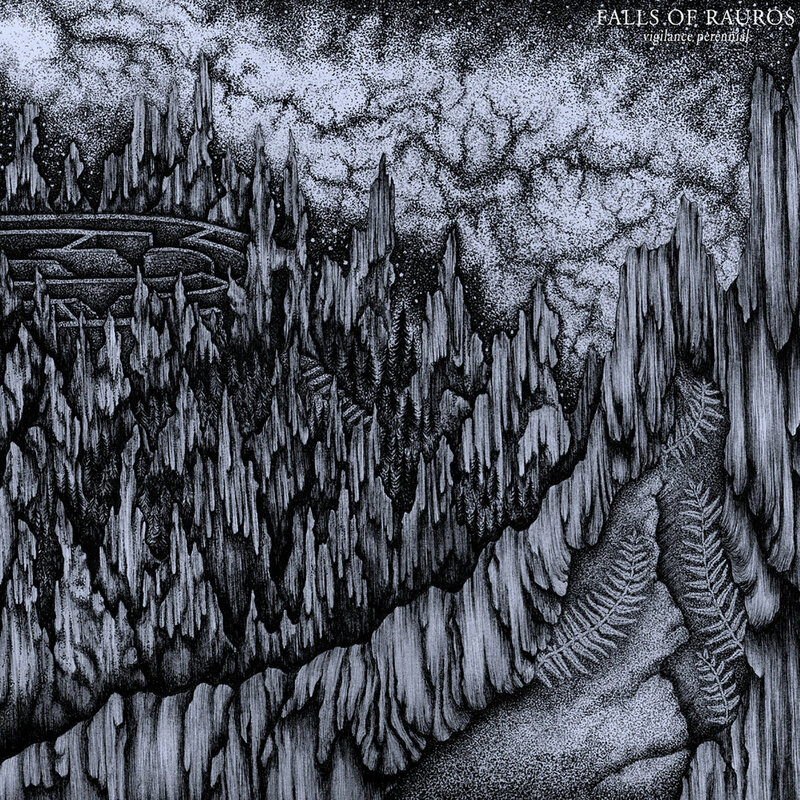 Crafting music like this takes a lot out of musicians and it seems as though Falls Of Rauros have put all they can into making this record unique and inviting, while still edging towards the dark side of humanity. One final thought about all of the bands featured here. As I eluded in my Falls Of Rauros review, bands invest so much of themselves in their music so that the finished product is the best it can be. There's point in delivering something that's half-assed and contrived. It's testament to Ahamkara, Waldgeflüster, Panopticon, Falls Of Rauros and indeed all of the other bands across the Bindrune/Nordvis Rosters that their energy and passion for creating this music is so obvious and catching.